Bangkok, capital of Thailand, was founded on this date in 1782. The history of the city dates at least to the early 15th century, when it was under the rule of the kingdom of Ayutthaya. Due to its strategic location near the mouth of the Chao Phraya River, the town gradually increased in importance, and after the fall of Ayutthaya, King Taksin established his new capital of Thonburi there, on the river’s western bank. King Buddha Yodfa Chulaloke, who succeeded Taksin, moved the capital to the eastern bank in 1782, to which the city dates its foundation under its current Thai name, Krung Thep Maha Nakhon. Bangkok has since undergone tremendous changes, growing rapidly, especially in the second half of the 20th century, to become the most important city in Thailand. It was the center of Siam’s modernization in the late 19th century, subjected to Allied bombing during the Second World War, and has long been the modern nation’s central political stage, with numerous uprisings and coups d’état having taken place on its streets throughout the years. It is not known exactly when the area which is now Bangkok was first settled. It probably originated as a small farming and trading community, located in a meander of the Chao Phraya River within the region of Ayutthaya’s influence. The town had become an important customs outpost by as early as the 15th century; the title of its customs official is given as Nai Phra Khanon Thonburi in a document from the reign of Ayutthayan king Chao Sam Phraya (1424–48). The name also appears in the 1805 revised code of laws known as the Law of Three Seals. At the time, the Chao Phraya flowed through what is now Bangkok Noi and Bangkok Yai Canals, forming a large loop in which the town was situated. In the reign of King Chairacha (either in 1538 or 1542), a waterway was excavated, bypassing the loop and easing navigation for ships sailing up to Ayutthaya. The flow of the river has since changed to follow the new waterway, dividing the town and making the western part an island. This geographical feature may have given the town the name Bang Ko (บางเกาะ), meaning island village, which later became Bangkok. Another theory regarding the origin of the name speculates that it is shortened from Bang Makok, makok being the name of Spondias pinnata, a plant bearing olive-like fruit. This is supported by the fact that Wat Arun, a historic temple in the area, used to be named Wat Makok. Specific mention of the town was first made in the royal chronicles from the reign of King Maha Chakkraphat (1548–68), giving its name as Thonburi Si Mahasamut. Bangkok was probably a colloquial name, albeit one widely adopted by foreign visitors. Ayutthaya’s maritime trade was at its height during the reign of King Narai (1656–88). Recognition of the city’s strategic location guarding the water passage to Ayutthaya lead to expansion of the military presence there. 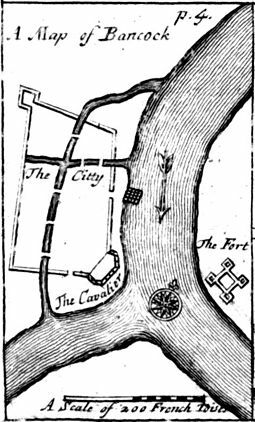 A fort of Western design was constructed on the eastern side of the river around 1685–87 under the supervision of French engineer de la Mare, probably replacing an earlier structure, while plans to rebuild the fort on the western bank were also made. De la Mare had arrived with the French embassy of Chevalier de Chaumont, and was remaining in Siam along with Chevalier de Forbin, who had been appointed governor of Bangkok. The Bangkok garrison under Forbin consisted of Siamese, Portuguese and French reportedly totaling about one thousand men. French control over the city was further consolidated when the French General Desfarges, who had arrived with the second French embassy in 1687, secured the king’s permission to establish troops there. 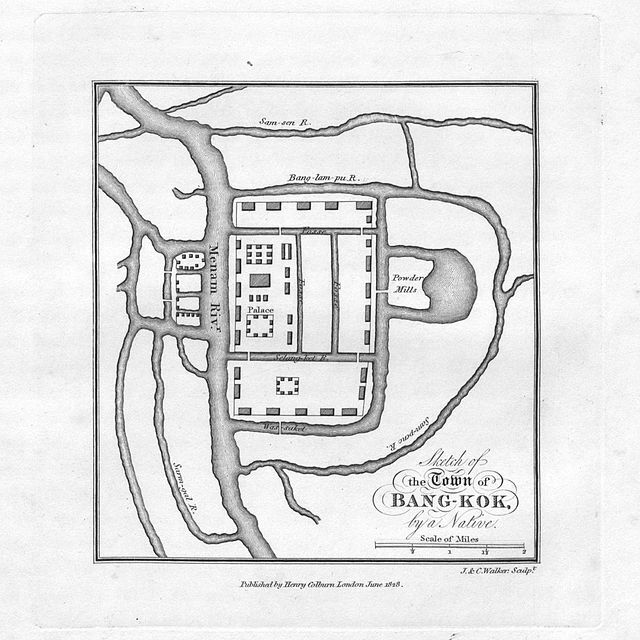 This, however, lead to resentment among Siamese nobles, led by Phetracha, and ultimately resulting in the Siamese revolution of 1688, in which King Narai was overthrown and 40,000 Siamese troops besieged Bangkok’s eastern fort for four months before an agreement was reached and the French were allowed to retreat. The revolution resulted in Siam’s ties with the West being virtually severed, steering its trade towards China and Japan. The eastern fort was subsequently demolished on Phetracha’s orders. Ayutthaya was razed by the Burmese in 1767. In the following months, multiple factions competed for control of the kingdom’s lands. Of these, Phraya Tak, governor of Tak and a general fighting in Ayutthaya’s defense prior to its fall, emerged as the strongest. 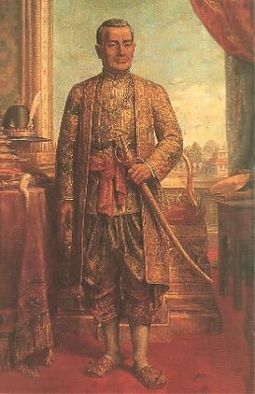 After succeeding in reclaiming the cities of Ayutthaya and Bangkok, Phraya Tak declared himself king (popularly known as King Taksin) in 1768 and established Thonburi as his capital. Reasons given for this change include the totality of Ayutthaya’s destruction and Thonburi’s strategic location. Being a fortified town with a sizeable population meant that not much would need to be reconstructed. The existence of an old Chinese trading settlement on the eastern bank allowed Taksin to use his Chinese connections to import rice and revive trade. 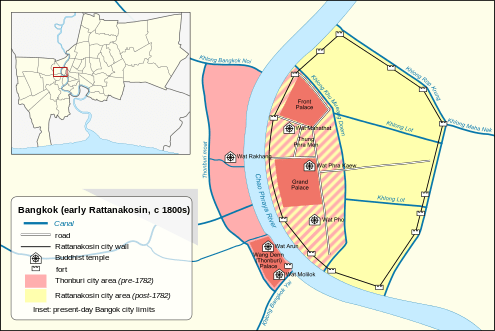 King Taksin had the city area extended northwards to border the Bangkok Noi Canal. A moat was dug to protect the city’s western border, on which new city walls and fortifications were built. Moats and walls were also constructed on the eastern bank, encircling the city together with the canals on the western side. The king’s palace was built within the old city walls, including the temples of Wat Chaeng (Wat Arun) and Wat Thai Talat (Wat Molilokkayaram) within the palace grounds. Outlying orchards were re-landscaped for rice farming. Much of Taksin’s reign was spent in military campaigns to consolidate the Thonburi Kingdom’s hold over Siamese lands. His kingdom, however, lasted only until 1782 when a coup was mounted against him, and the general Chao Phraya Chakri established himself as king, later to be known as Buddha Yodfa Chulaloke or Rama I.
Rama I re-established the capital on the more strategic eastern bank of the river called Rattanakosin Island, relocating the prior Chinese who had settled there to the area around Wat Sam Pluem and Wat Sampheng. (The area is now Yaowarat, Bangkok’s Chinatown.) Fortifications were rebuilt, and another series of moats was created, encircling the city in an area known as Rattanakosin Island. Rama I modeled his city after the former capital of Ayutthaya, with the Grand Palace, Front Palace and royal temples by the river, next to the royal field (now Sanam Luang). Continuing outwards were the royal court of justice, royal stables and military prison. Government offices were located within the Grand Palace, while residences of nobles were concentrated south of the palace walls. Settlements spread outwards from the city centre. The new capital is referred to in Thai sources as Rattanakosin, a name shared by the Siamese kingdom of this historical period. 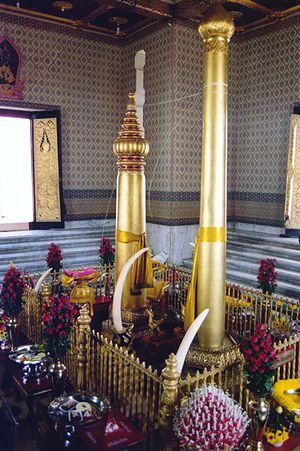 The name Krung Thep and Krung Thep Maha Nakhon, both shortened forms of the full ceremonial name, began to be used near the end of the 19th century. Foreigners, however, continued to refer to the city by the name Bangkok, which has seen continued use until this day. Most of Rama I’s reign was also marked by continued military campaigns, though the Burmese threat gradually declined afterwards. His successors consistently saw to the renovation of old temples, palaces, and monuments in the city. New canals were also built, gradually expanding the fledgling city as areas available for agriculture increased and new transport networks were created. At the time of the city’s foundation, most of the population lived by the river or the canals, often in floating houses on the water. Waterways served as the main method of transportation, and farming communities depended on them for irrigation. Outside the city walls, settlements sprawled along both river banks. Forced settlers, mostly captives of war, also formed several ethnic communities outside the city walls. Large numbers of Chinese immigrants continued to settle in Bangkok, especially during the early 19th century. Such was their prominence that Europeans visiting in the 1820s estimated that they formed over half of the city population. The Chinese excelled in trade, and led the development of a market economy. The Chinese settlement at Sampheng had become a bustling market by 1835. By the mid-19th century, the West had become an increasingly powerful presence. Missionaries, envoys and merchants began re-visiting Bangkok and Siam, bringing with them both modern innovations and the threat of colonialism. 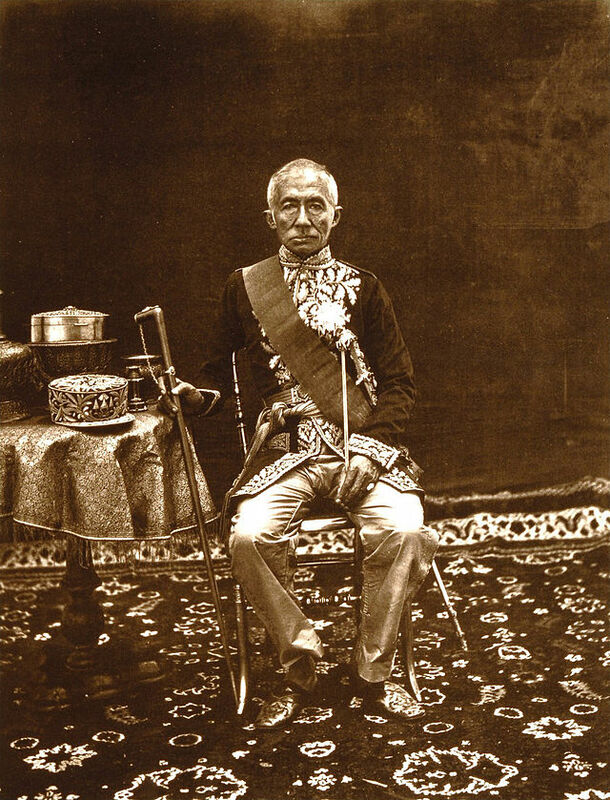 King Mongkut (Rama IV, reigned 1851–68) — of King and I fame — was open to Western ideas and knowledge, but was also forced to acknowledge their powers, with the signing of the Bowring Treaty in 1855. During his reign, industrialization began taking place in Bangkok, which saw the introduction of the steam engine, modern shipbuilding and the printing press. Influenced by the Western community, Charoen Krung Road, the city’s first paved street, was constructed in 1862–64. This was followed by Bamrung Mueang, Fueang Nakhon, Trong (now Rama IV) and Si Lom Roads. Land transport would later surpass the canals in importance, shifting people’s homes from floating dwellings toward permanent buildings. The limits of the city proper were also expanded during his reign, extending to the Phadung Krung Kasem Canal, dug in 1851. King Mongkut’s son Chulalongkorn (r. 1868–1910) was set upon modernizing the country. He engaged in wide-ranging reforms, abolishing slavery, corvée (forced labor), and the feudal system, and creating a centralized bureaucracy and a professional army. The Western concept of nationhood was adopted, and national borders demarcated against British and French territories. Disputes with the French resulted in the Paknam Incident in 1893, when the French sent gunboats up the Chao Phraya to blockade Bangkok, resulting in Siam’s concession of territory to France. With Chulalongkorn’s reforms, governance of the capital and the surrounding areas, established as Monthon Krung Thep Phra Mahanakhon, came under the Ministry of Urban Affairs (Nakhonban). During his reign many more canals and roads were built, expanding the urban reaches of the capital. 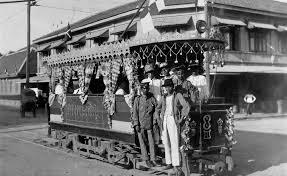 Infrastructure was developed, with the introduction of railway and telegraph services between Bangkok and Samut Prakan and then expanding countrywide. Electricity was introduced, first to palaces and government offices, then to serve electric trams in the capital and later the general public. The King’s fascination with the West was reflected in the royal adoption of Western dress and fashions, but most noticeably in architecture. He commissioned the construction of the neoclassical Ananta Samakhom Throne Hall at the new Dusit Palace, which was linked to the historic city centre by the grand Ratchadamnoen Avenue, inspired by the Champs-Élysées in Paris. Examples of Western influence in architecture became visible throughout the city. The spot on which the present capital stands, and the country in its vicinity, on both banks of the river for a considerable distance, were formerly, before the removal of the court to its present situation, called Bang-kok ; but since that time it has been named Sia yuthia, (pronounced See-ah you-tè-ah, and by the locals, Krung, that is, the capital); it is called by both names here, but never Bang-kok ; and they always correct foreigners when the latter make this mistake. The villages which occupy the right hand of the river, opposite to the capital, pass under the general name of Bang-kok. Thai dishes are now known worldwide due to the proliferation of Thai restaurants. They are popular in the part of China where I live, Yunnan Province, because it borders on Thailand, and because one of the major ethnic minorities here, the Dai, are closely related to the Thai. There has been cultural exchange and migration between southern China and Thailand for centuries. I have been cooking Thai dishes for decades whenever I can get the proper ingredients. You can make substitutions but you won’t get the right tastes. Mostly I rely on prepared pastes and sauces, readily available in oriental markets – even in Buenos Aires in barrio chino. Modern cooks in Thailand use them a great deal nowadays for convenience. I am a big fan of Thai green curry and have always kept the paste on hand. It is not especially hot, but does have the four cardinal savors of Thailand: sweet, salty, sour and, hot. Green curry (kaeng khiao wan, literally sweet green curry) is a Central Thai variety of curry. The name “green” curry derives from the color of the dish, which comes from green chiles. The “sweet” in the Thai name (wan means “sweet”) refers to the particular color green itself and not to the taste of the curry. As this is a Thai curry based on coconut milk and fresh green chiles, the color comes out creamy mild green. Its ingredients are not exactly fixed. The curry is not necessarily sweeter than other Thai curries but, although the spiciness varies, it tends to be more pungent than the milder red curries. Apart from a main protein, traditionally fish, meat, or fish balls, the other mainingredients for the dish are coconut milk, green curry paste, palm sugar, and fish sauce. Vegetables such as Thai eggplant and sugar pea pods may be added. The consistency of its sauce varies with the amount of coconut milk used. Green curry paste is traditionally made by pounding in a mortar green chiles, shallots, garlic, galangal, lemongrass, kaffir lime peel, coriander root, red turmeric, roasted coriander and cumin seeds, white peppercorns, shrimp paste and salt. The paste is fried in coconut cream until the oil is expressed to release the aromas in the paste. Once the curry paste is cooked, more coconut milk and the remaining ingredients are added along with a pinch of palm sugar and fish sauce. Finally, as garnishes, Thai basil, fresh kaffir lime leaves, sliced phrik chi fa (“sky-pointing chilies”, large mild chilies) are often used. For a more robust green curry, such as with seafood, julienned krachai (fingerroot/wild ginger/Chinese keys), white turmeric, and holy basil can be used as garnishes. Green curry is typically eaten with rice as part of a wider range of dishes in a meal, or with round rice noodles known as khanom chin as a single dish. 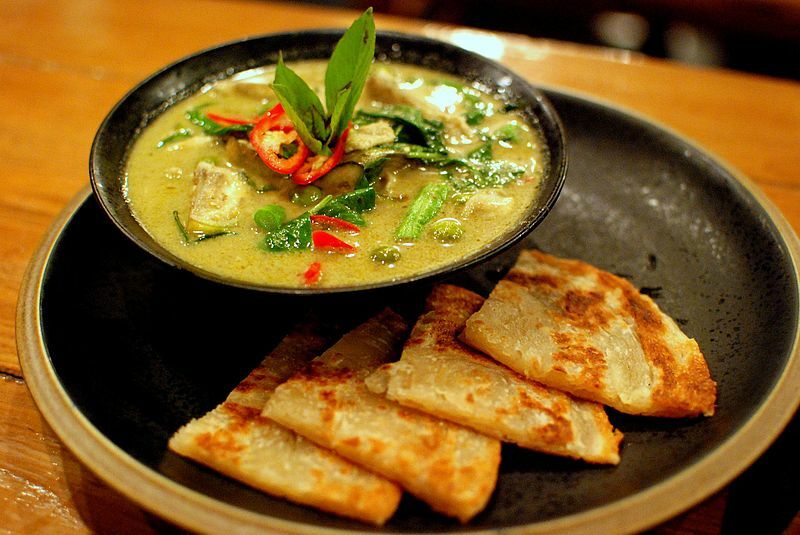 A thicker version of green curry made with, for instance, simmered beef, can also be served with roti, an Indian style flatbread that is similar to the roti canai in Malaysia. Place all the paste ingredients together in a food processor, and process to a paste. Set aside. Prepare lime leaves by cutting the leaves away from either side of the stem. Discard central stem. Then cut the leaves into thin strips. Set aside. Warm a wok or large frying pan over medium-high heat. Add the oil and swirl around, then add the green curry paste. Stir-fry briefly to release the fragrance. (30 seconds to 1 minute), then add most of the remaining coconut milk, reserving 1 tablespoon per serving portion for later. Add chicken, stirring to incorporate. When the curry sauce comes to a boil, reduce the heat to medium or medium-low andimmer 5 minutes, or until chicken is cooked through. Stir occasionally. Add the strips of lime leaf, stirring well to incorporate. Simmer a few minutes more. Then check the flavorings to ensure a balance of salty, spicy, sweet and sour.